Poly Wall® Home Stretch™ ICF Waterproofing Membrane is specifically designed and engineered for use with ICF technology (Insulated Concrete Forms). It is also an excellent choice for use on poured concrete foundation walls, CMU (Concrete Masonry Unit) walls and related applications where waterproofing is critical or hydrostatic pressure is present. Home Stretch™ ICF is a self-adhering sheet waterproofing membrane 40 mils thick which consists of a strong pliable high density polyethylene (HDPE) facing bonded to a rubberized asphalt waterproofing compound that has been proven over many years of use to a be supremely effective waterproofing. Home Stretch™ ICF is available in easy to handle and install 36” wide by 66.7’ long rolls (200 sf / roll) with a disposable treated release liner. Detail tape made of the same design is available to address, transitions and corners. Use Home Stretch™ in a complete waterproofing system with our Shur-Tac™ Primer, Joint Filler 2200, Arroyo™ Drain Board and accessories. Poly Wall® Home Stretch™ Detail Tape is a strong, pliable, self-adhering strip of rubberized asphalt and high density polyethylene at 40 mils used for inside and outside corners, penetrations and footer in preparation of applying Home Stretch™ Waterproofing Sheet Membrane. Poly Wall® Blue Barrier™ Joint Filler 2200 can be used as a detail sealant to fill voids and seams. 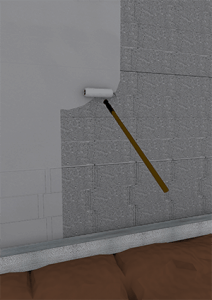 In this case it is used as a 3/4" filler at the wall and footer intersection and inside corners on the raw concrete. Poly Wall® Shur-Tac™ Liquid Adhesive is an integral part of Poly-Wall Self-Adhering Membrane Systems. This liquid adhesive can be used on dry surfaces to condition them to be suitable for the application of Poly-Wall Self-Adhering Membranes and Flashings. Poly Wall® Arroyo™ Drain Board is a sheet molded drain that establishes predetermined pathways for below-grade water management. A factory applied fabric allows water to pass into the drain core while restricting the movement of soil particles which might clog the core. The core allows the water to flow to designated drainage. Arroyo™ Drain Boards are designed for vertical applications and are great protection layers for Poly Wall® Home Stretch™ sheet and liquid waterproofing products. Poly Wall® Arroyo™ Outlet Channel is prefabricated, high-capacity sheet molded perimeter drainage system constructed using a formed polystyrene core, designed specifically to transition water collected from sheet drains to an outlet drain. The Arroyo™ Outlet Channel system along with end & tee accessories complete your vertical drainage & waterproofing protection system. Poly Wall® Home Stretch™ Liquid Waterproofing is a elastomeric coating which cures to form a durable waterproofing membrane capable of bridging cracks up to 1/16th of an inch. Home Stretch™ Liquid is designed for waterproofing concrete, precast concrete, CMU and other vertical surfaces where hydrostatic pressure may be present. When used with Poly Wall’s Arroyo™ Drain Board, Home Stretch™ Liquid Waterproofing provides a complete waterproofing system. Polybond™ Liquid Adhesive Primer is a rubber based adhesive in solvent solution. May be applied by roller or brush. Increases adhesive bond of flashing products to common substrates such as OSB, plywood, concrete, CMU and exterior Gypsum. Available in 1 and 5 gallon containers.